David saw this on the side of a van. 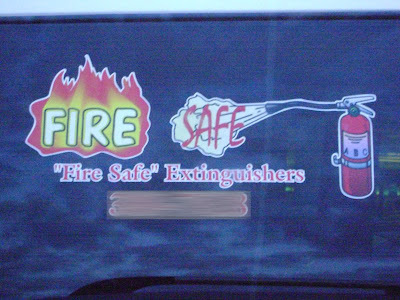 I'm thinking extinguishers are the one thing you'd want to be literally fire safe. Signs like this never cease to amaze me. they don't seem too confident do they? Strange that they first have the words *without* the quotation marks. The iteration must have been an afterthought. "Fire safe" is a quote from the inventor of fire as he or she pitched the idea to neighbors.